What Did Gillibrand Just Say Was an 'Urgent Goal'? In a recent podcast interview, Sen. Kirsten Gillibrand (D-NY) didn't hide her agenda for the new Congress. She is apparently eager for the chance to get rid of those pesky private health insurance plans. Asked pretty straightforwardly if gutting private insurance was a "goal" of the Democratic Party's, the senator was rather candid. "Oh yeah, it is a goal," Gillbrand said. "And it is an urgent goal." 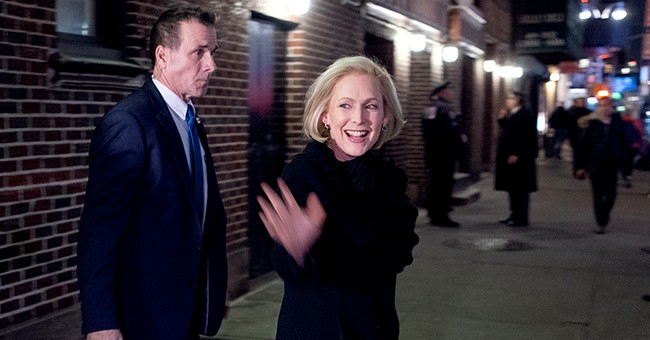 Gillibrand has long supported a "single player" government run health care plan. In 2017 she quickly signed on to Sen. Bernie Sanders's proposed "Medicare for All" bill, which some would call socialist. At the time, Gillibrand said Sanders's plan was "something better." But, something better comes with a price, according to an Urban Institute study. Their research found that Sanders’s plan would increase federal expenditures by $32 trillion over 10 years. Gillbrand's 2020 platform isn't the only one that's shaping up to be somewhat radical. In fact, several of the already announced 2020 Democrats have latched on to Rep. Alexandria Ocasio-Cortez's (D-NY) farfetched Green New Deal, a plan that demands reduced air travel and the revamping of every building in the U.S. Despite those lofty goals, it's received blessings from presidential contenders Sens. Elizabeth Warren (D-MA), Kamala Harris (CA) and Sen. Cory Booker (NJ), who compared the environmental resolution to America's successful 1969 moon landing. From most others in Congress it's received scorn. House Speaker Nancy Pelosi lovingly called it "the green dream or whatever." Trump's re-election team must be giddy at the moment.